1, 3 butadiene is a colorless, synthetic gas or liquid which is used as a chemical intermediate or as monomer (a molecule that can make bond with other similar molecules to form a polymer). 1, 3butadiene is highly used in manufacturing of synthetic rubbers or elastomers. Further, 1, 3butadiene is highly insoluble in water and is highly soluble in ethanol, ether, acetone and benzene. Furthermore, different types of polymers and monomers can be produced by using 1, 3 butadiene such as styrene-butadiene rubber, nitrile rubber, polychloroprene and poly butadiene rubber. Such polymers and monomers are used to produce goods and materials such as tire products, paper coating, carpet, plastic materials, gloves, wetsuits, gaskets, waders and others. 1, 3 butadiene is a flammable gas and in presence of oxygen it forms explosive peroxides by oxidization process. 1, 3 butadiene is dangerous for humans and direct exposure of 1, 3 butadiene can cause irritation of eyes & throat, headache, low blood pressure, unconsciousness and other hazardous effects on human body. Global 1, 3 butadiene market is projected to flourish at a robust compound annual growth rate (CAGR) during the forecast period. Further, global 1,3 butadiene market is expected to reach at a valuation of around USD 33.5 Billion over the forecast period i.e. 2017-2024. Factors such as rising demand for good tires on account of growing automobile sector and rising preference of butadiene in production of consumer products are expected to be the key factors behind the growth of global 1,3 butadiene market during forecast period. Moreover, North America region captured the second leading position in global market of 1, 3 butadiene. Further, North America region is expected to witness remarkable growth during the forecast period due to growing demand for elastomers in tires and other consumer products in this region. Additionally, Europe region is also expected to grow at a satisfactory pace during the forecast period owing to increasing application of 1, 3 butadiene in tire industries and in other downstream applications in this region. 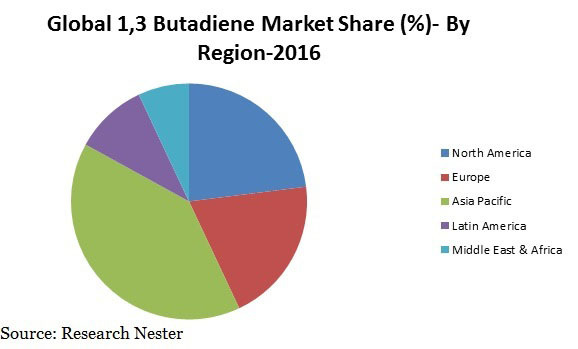 Global 1,3 butadiene market is primarily driven by rising adoption of 1, 3 butadiene in end-use industries such as automobile, healthcare and building & construction. Additionally, 1,3 butadiene offers elastomers in products such as tire and other products. Further, growing demand for elastomers property in various consumer products is vital consideration for the growth of global 1, 3 butadiene market. Moreover, 1,3 butadiene is highly used in production of tires and other automotive parts in order to improve their elastic properties. Further, global 1, 3 butadiene market is envisioned to flourish on account of growing automobile industries in countries such as India, China and Brazil. Apart from this, rising population, increasing disposable income & purchasing power of the consumers and changing life style of population are major reasons which have increased the preference of 1,3 butadiene in production of consumer products. Further, growing selection of 1,3 butadiene in production of consumer products is a major factor which is envisioned to drive the global 1,3butadiene market in near future. However, maturity of the product and prices of raw material are some of the major challenges towards the growth of global 1,3 butadiene market. Further. This factor is likely to hamper the growth of global 1,3butadiene market in near future.